Caterham F1 Team this afternoon announced that Tony Fernandes has sold Caterham to a consortium of Swiss and Middle-Eastern investors who were advised by former HRT Team Principal Colin Kolles. The team will continue to operate as Caterham F1 Team from its factory in Leafield. Former Minardi and Spyker driver Christijan Albers will be in charge of the day-to-day running of the team, while Cyril Abiteboul, the former Team Principal, will leave the team. Rumours have surrounded the sale of Caterham for several months and speculation increased following a series of cryptic tweets from Caterham owner Tony Fernandes who tweeted “F1 didn’t work” before deleting his account. Caterham lost out to rivals Marussia when the team, who joined F1 alongside Caterham and the now-dead HRT team in 2010, scored their first points at the Monaco Grand Prix in May. 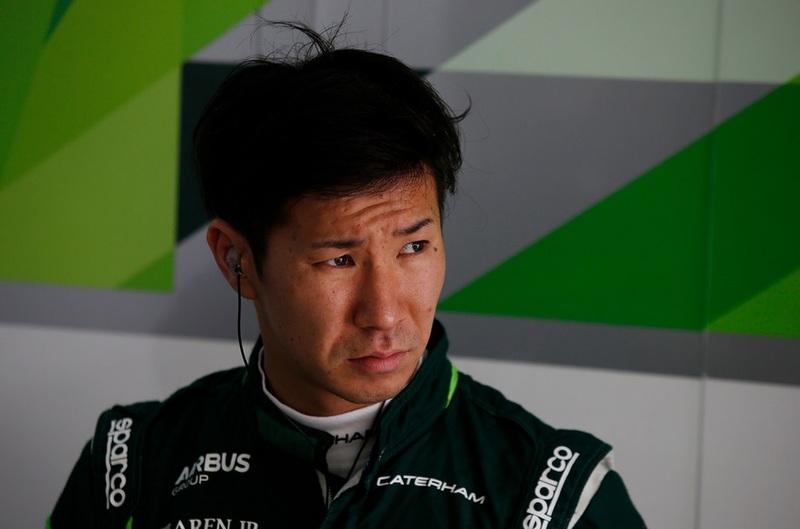 Kamui Kobayashi says he is aiming to ‘fight back’ at the next Grand Prix in Monaco. The Caterham driver was reflecting on the Spanish Grand Prix which saw him retire with a brakes failure to round-out a “difficult weekend” for the 27-year-old. Caterham were far off the pace of rivals Marussia as news broke that they had replaced their technical director with a committee. Kobayashi then turned his attention to the upcoming two-day test at the Circuit de Catalunya and to Monaco, where he hopes to do better. Marcus Ericsson was hit by Pastor Maldonado on the second lap and he finished in twentieth – last of the finishers. 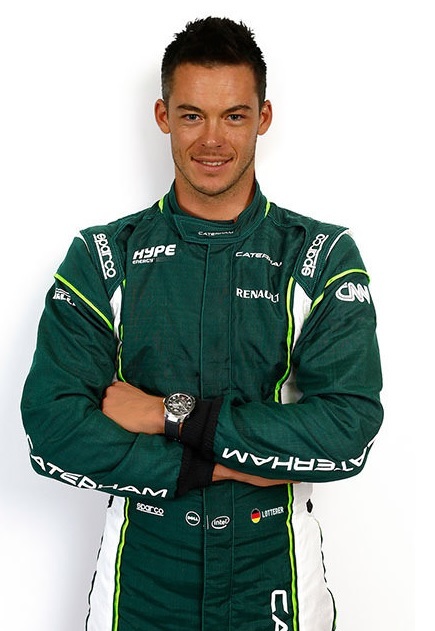 Image courtesy Caterham F1 Team. This is definitely one of the perks of being a Formula One driver. In this video, Caterham driver Kamui Kobayashi drives the incredible Caterham 620R at Silverstone. I hope, for Kamui’s sake, that this is the company car. Marcus Ericsson has vowed to ‘come back fighting’ after a crash during Qualifying today. The Swede got onto the white lines at the exit of turn 3, helplessly spinning into the gravel, hitting the barrier and spinning back onto the track, into the path of Sauber’s Esteban Gutierrez who narrowly missed the out-of-control Caterham. Reflecting on Qualifying, Ericsson pointed out that he had never driven in wet conditions before: “The rain started before quali and we went into the delayed session knowing we’d start on a wet track. That was my first ever wet running in F1, in any session, so from the first lap it was all a new experience for me. “With every lap I was learning more and more,” he continued. “We made a quick stop with a few minutes left to put on another set of inters, but then on the final quick lap I made a mistake in sector one and crashed. I’m really sorry for the team. They’ve worked so hard all weekend on the problems we’ve had, and now they have another huge job ahead of them to prepare the car for tomorrow, but I know they’ll keep pushing and we’ll all come back fighting tomorrow. The team was forced to work on Ericsson’s car last night when an oil leak was discovered after second practice. They were also tasked with stripping and rebuilding Kamui Kobayashi’s car after he suffered an Energy Recovery System (ERS) failure. To read about the action packed Qualifying session this morning, click here. Kamui Kobayashi has apologised to Felipe Massa following a crash at the first corner of today’s Grand Prix. The Caterham driver locked his front brakes following a rear brake failure caused by a KERS issue, which sent him careering helplessly into Ferrari’s Kimi Raikkonen first and then the Williams of Felipe Massa, the latter ending up in the gravel with Kobayashi. Although Massa blasted Kobayashi for braking too late, the Stewards accepted the technical data presented by Caterham which proved the brakes failure on Kobayashi’s car. 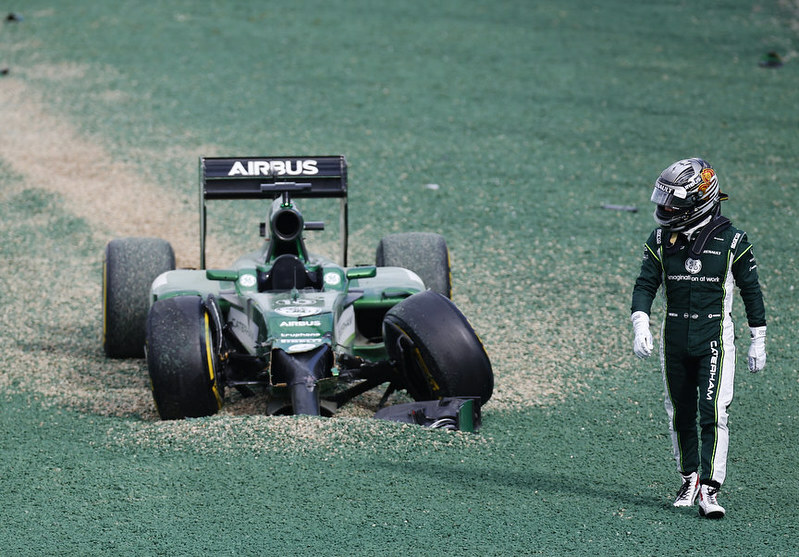 It’s little consolation for Kamui, however, as he was starting from an impressive fourteenth when he had the accident. “That isn’t how I wanted my first race back to go, and I’m sorry for the team and for Felipe that both our races ended early,” Kamui said after the race. ” I had a really good start but then into turn one I made contact with Felipe. “From the initial data it looked like I had a brake system issue which obviously meant I couldn’t do much about the contact and when we got the car back and looked at the information in much more detail it was clear that was the problem. After the race I went to the Stewards and they went through the data from the car and confirmed this was the case. We’ll have a close look at what caused that problem and make sure we fix it. Felipe Massa was the innocent victim of the incident and post-race expressed his disappointed but tried to stay positive: “I’m obviously very disappointed as I had the sort of car capable of challenging for a podium today, but the incident at the first corner ruined my race. I tried to have a calm start and not take any risks, but was hit from behind after Kobayashi braked too late and there was nothing I could do to avoid being taken out of the race. Kobayashi’s team-mate, Marcus Ericsson, retired later in the race with an oil pressure issue, while Valtteri Bottas survived contact with the wall to finish sixth in the other Williams. 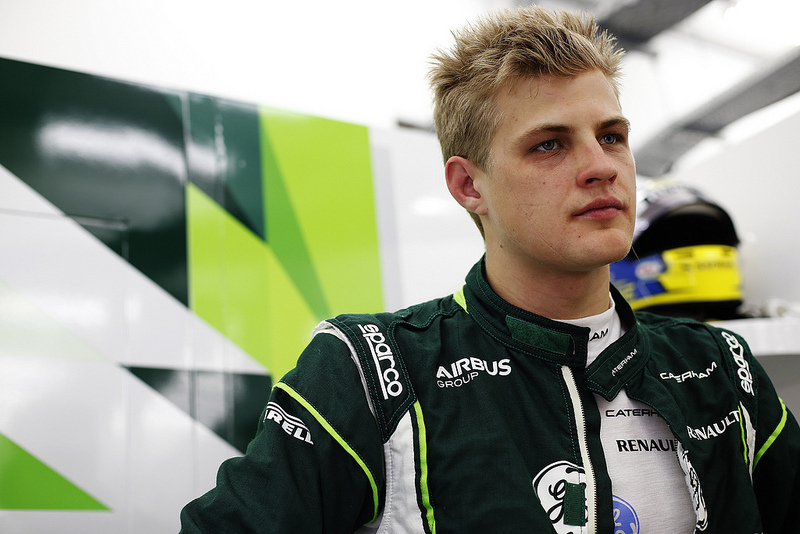 Caterham rookie Marcus Ericsson believes he is ready for his first Grand Prix. The 23-year-old Swede took one win en route to finishing sixth in the GP2 Championship while racing with DAMS last year, and was subsequently promoted to F1 with Caterham. Although admitting that one can never be fully prepared for their first race, he and his team are as ready as they will ever be. “I’ve been working for this chance since I started racing, and now it’s finally coming true, thanks to all the people who’ve supported me, and to the team for giving me this chance. We’ve done everything we can to prepare, but, honestly, I don’t think you can ever prepare for what it’ll feel like in the car, sitting on the grid as the lights go out in my debut race – however, that feeling will go very quickly and I know I’m ready to race. Speaking of the pre-season testing, which did not show good omens for the Renault powered teams (which includes Caterham), Ericsson acknowledged the difficulties but does not expect too many surprises come lights out in next Sunday. “The pre-season tests were tough, but at the end of them we’d got through most of what we planned, so there shouldn’t be too many surprises in Melbourne. By the end of the tests our reliability was best of the Renault teams and we ran through a race simulation, including the formation lap procedure, starts and pitstops, so with the mileage we completed in both Bahrain tests, we’re as ready as we can be. The Australian Grand Prix next Sunday kicks off the 2014 season. Ericsson will line up alongside Kamui Kobayashi, who missed 2013 over sponsorship problems. Image courtesy Caterham F1 Team/LAT Photographic.